Technology marketers are generally early adopters of the latest digital marketing tactics. They were among the first marketers to build websites, to advertise online, to grasp search engine marketing, and most importantly to embrace social media. So, perhaps it’s not surprising that tech marketers are among the leaders in using LinkedIn to lead their content marketing strategy. Of the top 10 most influential global brands on LinkedIn, technology companies accounted for six of the top slots, with Microsoft, Domo, IBM, Hewlett-Packard, Google, and Salesforce making the list. Now we’re taking a deeper dive into how leading technology marketers are using the LinkedIn platform. Introducing “The Content Marketing 50: High Tech Edition.” In this infographic, we’ve identified the 50 most effective technology brands when it comes to using the LinkedIn platform to engage, educate, and inspire their target audience. Not only do these marquee names know how to position their brand and products with engaging and comment-worthy content on LinkedIn, they also know their audience – and where to find them. 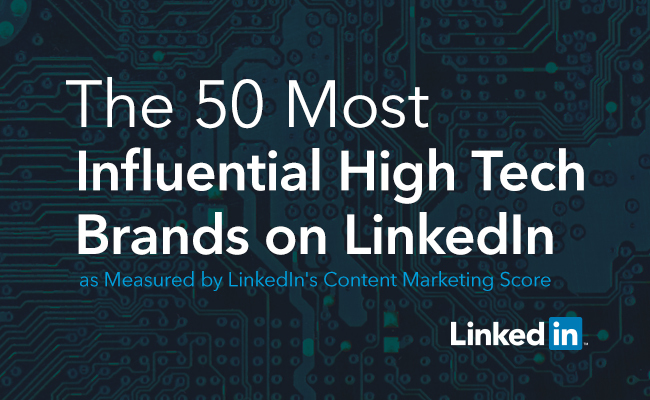 The top 50 most influential tech brands on LinkedIn were determined using the LinkedIn Content Marketing Score. A brand’s Content Marketing Score is calculated by measuring the ratio between the total target audience and the unique users that engaged with the content so far in 2015. The Content Marketing Score evaluates all content-based activities on the LinkedIn platform, such as Company Page updates, employee shares, Sponsored Updates, activities in Groups and Influencer and employee posts through self Publishing on LinkedIn. 100% of the 50 top tech brands have employees sharing and posting content on their networks. 100% regularly share updates on their LinkedIn Company Page with the top brands averaging between 14 and 46 posts were week. 100% invest in LinkedIn Sponsored Updates to give their brands a consistent presence in the LinkedIn feeds of their target audiences. What do these numbers mean? They mean that the top 50 high tech brands on LinkedIn are using a mix of reach, frequency, and engagement to reach their audiences – and boost their CMS score. These brands are encouraging their employees to share and post content on LinkedIn, thus allowing them to act like influencers and boost their reach and engagement. Additionally, they are posting frequently, consistently and in a timely manner in a way that is relevant to their audiences. In fact, the most effective LinkedIn marketers take an always-on approach to content. 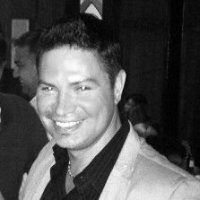 This approach helps to keep them front-of-mind among high-value consumers – but it also ensures that those consumers feel uniquely informed about the brands they identify with. When LinkedIn members follow the company pages of our top brands, it ensures that they are among the first to know about new announcements and new products and new designs. Did your brand make the top 50? Did your competitors? View the entire top 50 in The Content Marketing 50: High Tech Edition infographic.